Last January we wrote a piece called, “5 Microservices Trends to Watch in 2018,” which identified service meshes, event-driven architectures, container-native security, GraphQL, and chaos engineering. Were we right? Over the past year, each of these technologies exhibited accelerated adoption and popularity. Below we underscore some highlights of 2018. 1. Service meshes are hot! We cataloged over 15 different service mesh offerings. Istio had its first birthday and released v1.0.4. GCP began offering a hosted version of the solution. VMware introduced NSX Service Mesh that is built on Istio and extends NSX’s capabilities across Kubernetes clusters. 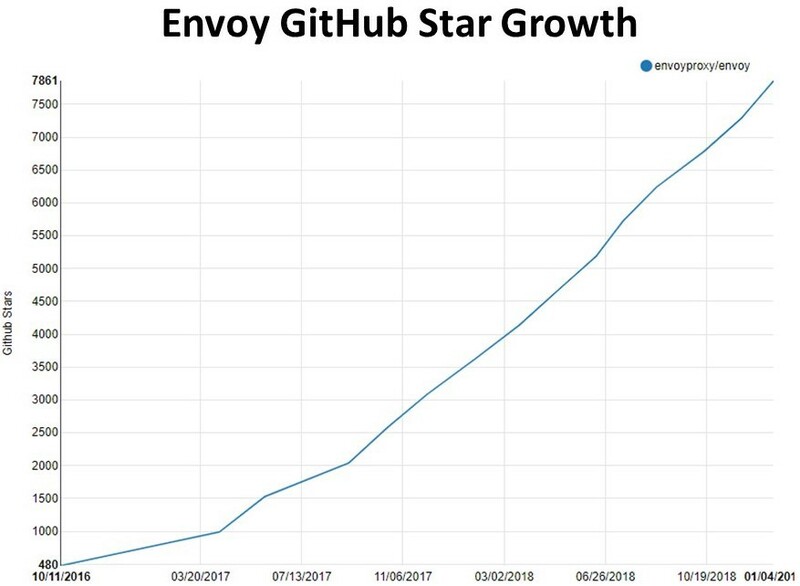 Envoy achieved ~7.9K GitHub stars across users including eBay, Netflix, Pinterest, Stripe, etc. (see chart below). The project graduated from the CNCF and hosted its own day of tailored content at KubeCon Seattle. In November at AWS Re: Invent, Amazon introduced App Mesh, a service mesh built on Envoy. HashiCorp extended Consul’s functionality from service discovery to a full service mesh. HashiCorp Consul 1.4 offers compatibility with Kubernetes and multi-data center support. Solo.io launched from stealth and announced its GlooE platform, which helps enterprises modernize monolithic applications to containers and functions using Envoy. Solo also offers SuperGloo, a service mesh orchestration platform that simplifies the installation, management, and operation of any service mesh. 2. Rise of event-driven architectures. In February, we co-authored a landscape identifying 54 serverless cloud native offerings. The most recent version exhibits 62 solutions. ServerlessConf grew 20% to over 550 attendees, up from 460 participants the year before. AWS Lambda continued to be the most popular serverless runtime with 71% market share and extended executions up to 15 minutes. AWS announced Firecracker, a lightweight virtual machine manager to create a microVM in ~125ms for Lambda functions and Fargate containers. Firecracker intends to make functions more secure like Kata Containers and Google gVisor. Time series databases like Influx, Timescale, Prometheus, etc. gained mind share. Amazon released Timestream. 3. Security needs are changing. Cloud service providers announced Google gVisor and Amazon Firecracker to provide secure isolation for containers that is less resource intensive than running a full virtual machine. The first Kubernetes security hole was discovered. The privilege escalation flaw allowed any user to gain full administrator privileges on any compute node being run in a Kubernetes pod. It has been patched. Some container security start-ups announce funding: Stackrox (Series B), Twistlock (Series C), Sysdig (Series D), and Capsule8 (Series B). 4. Moving to GraphQL from REST. 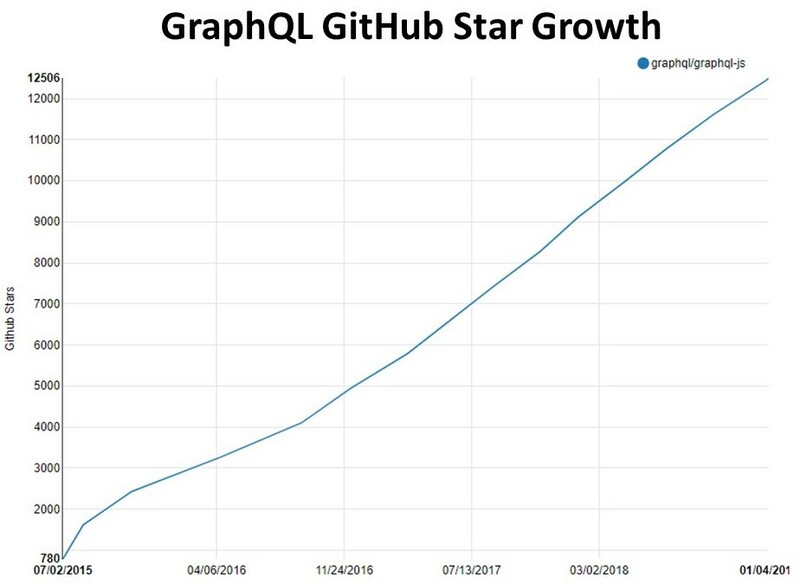 The GraphQL Summit grew over 30% to 850 attendees from 650 participants the year before. Linux announced its intent to form a new foundation to support GraphQL. Apollo announced its open-core Apollo GraphQL Platform to help developers stand up a GraphQL system. The platform includes a server, client, and engine (GraphQL query execution gateway) as well as governance and management tools. Prisma and Hasura, startups focusing on data access over GraphQL, announced funding. 5. Chaos engineering becomes more well-known. David Blank-Edelman’s O’Reilly book “Seeking SRE” highlights chaos engineering as a best practice. 350 people attended the first chaos engineering conference “Chaos Conf” that sold out! The CNCF established a Working Group for Chaos Engineering. Chaos engineering startup Gremlin announced its Series B financing, application level fault injection, and container support. During 2018 service meshes, event-driven architectures, container-native security, GraphQL, and chaos engineering continued to increase in popularity. In 2019 we expect these emerging technologies to move up the hype cycle moving closer to the peak of expectations.